When I was little we used to spend part of the summer at our grandparents’ home in Downers Grove, outside of Chicago. I haven’t been back since, but at the time Downers Grove was a small suburban location, almost rural. Two of my strongest memories from those visits pertained to food. Pepperidge Farm was located in Downers Grove and I used to love walking by their baking facility; the aroma of baking bread was almost tangible. The other memory was cherries. My grandmother used to can cherries from her trees and her pantry was laden with quart-sized jars of cherries. I can’t recall what my grandmother looked like, or anything about her, but I do remember the shelves of canned cherries. They were delicious eaten right out of the jar and to this day I don’t think there’s anything tastier than a cherry pie made with fresh cherries. Cherry season in Rome doesn’t last long, just a month or so from mid-May to the end of June. It’s unbearable that cherries are available for such a short time period, but it makes them all the more desirable when they are in season. I plan to bake a cherry pie this week, but today I opted for cherry ice cream. We’re doing an 80th birthday dinner for one of our clients and her family, and I’ve baked her a luscious chocolate birthday cake for the event. Cherries and chocolate are a natural together, so cherry ice cream seemed a grand idea on this hot June day. 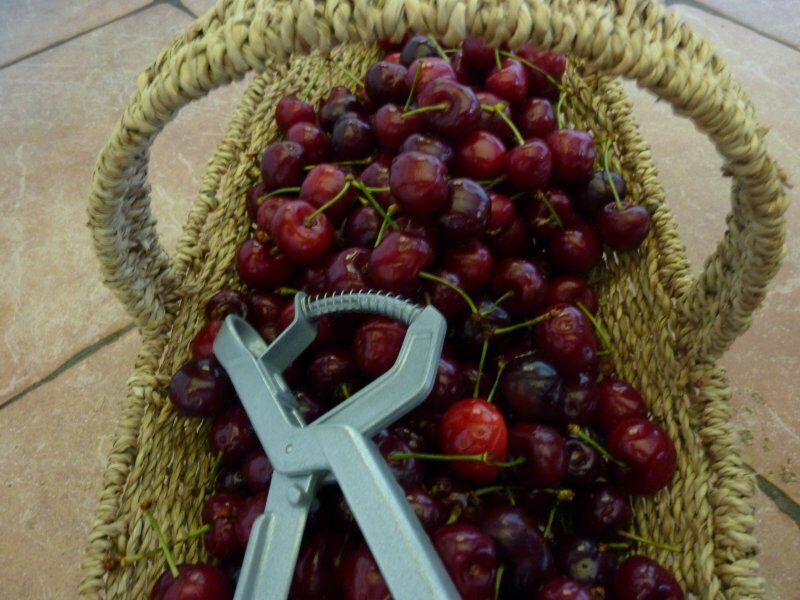 Pit the cherries using a cherry (olive) pitter, like the one below. Toss the cherries in the sugar and set aside. Cream the egg yolks and sugar together until the yolks are a pale yellow. 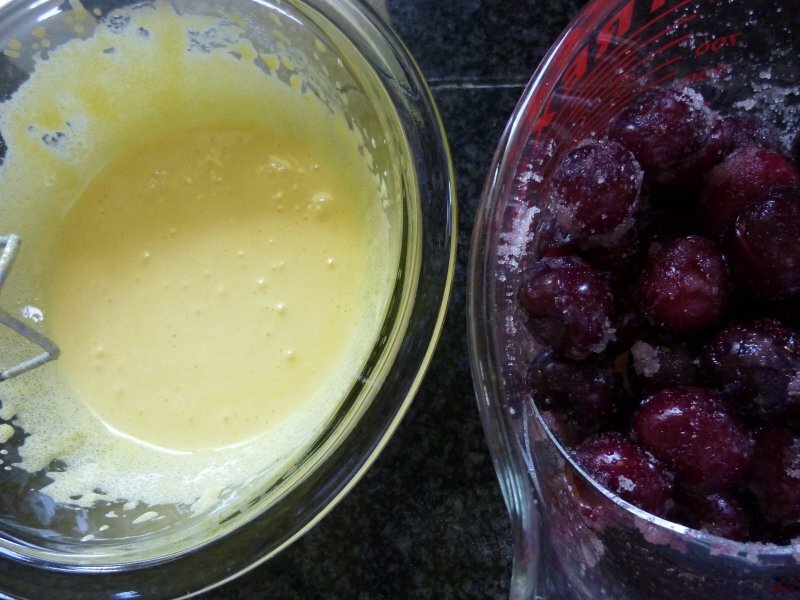 Put the cream, milk and cherries in a blender and process until the cherries are roughly chopped. Cook the cream, milk and cherry mixture several minutes on medium until warm. Add the salt, egg yolks and sugar and cook several minutes over low heat until the mixture coats a wooden spoon. Stir in the cherry syrup. Place the pan in a sink full of ice water and stir occasionally until cool. Put the pan in the freezer and stir every 30 minutes until frozen solid. You might want to try the Simply Recipes version of cherry ice cream with chocolate chips; or check out Canadian Living‘s recipe.